Tinnitus is the sensation of ringing or noise inside of your ear and there are several possible causes. Tinnitus is when you hear noise or ringing inside of your ears. It isn’t a condition on it’s own, but it is a symptom of other problems such as hearing loss or an ear injury. Here are some of the potential causes of Tinnitus. Often times, when you get older, you can suffer from hearing loss just because of the fact that you are aging. This typically starts around age 60. As mentioned before, hearing loss can be a cause of tinnitus, causing your ears to ring. If you hear a sudden loud noise from construction equipment or firearms, it can cause Tinnitus as well. With sudden noises and short term exposure to loud noise, the Tinnitus is typically temporary and will go away with time. Long term exposure to loud noises, such as regularly playing your headphones too loudly, can result in permanent damage. Earwax is meant to protect your ear by catching dirt and keeping bacteria from growing so quickly. However, too much earwax can actually cause problems. An excess amount of earwax makes it hard to wash away on its own, so it can irritate the eardrum or cause hearing loss, leading to Tinnitus. A less common cause of Tinnitus comes from various TMJ (temporomandibular joint) disorders. TMJ refers to the joints on each side of your head where the lower jaw connects to the skull. TMJ problems can cause your ears to ring. There is a condition called Otosclerosis, which is when the bones in your middle ear start to become stiff. This can affect your hearing, which can eventually lead to Tinnitus. This condition is typically genetic and is caused by abnormal growth of the ear bone. 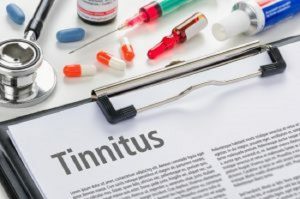 Do You Think You May Have Tinnitus? Contact Bay Area Audiology Today!